In my state, a peace officer can make an arrest for any simple misdemeanor and above. I’d guess most states are the same. We always have the option of citing them into court (giving them a ticket), but for firearms offenses, you’d better haul them in or the public goes nuts. Yea I can see that. I bet the papers would be all over it if anyone with a minor firearms violation just got off with a small fine. In most states, and especially in my home state of Illinois, misdemeanors are arrestable offenses. From my past experiences, if you break the law and the charges are misdemeanor level, you are taken to jail, processed, and held there until bail can be paid. I always wondered, can you just pay bail with your own money? or does someone else have to come pay it for you? You can pay it with your own money if you have access to it. In my case, I had my debit card and about 10 bucks on my person. They put the 10 towards my bail and then I had to pass the debit card to my girlfriend to get the rest. I sort of figured that it was a requirement for an arrest to be made and a formal booking for a misdemeanor, but I don’t know. There are a lot of things that’ll get you arrested that are misdemeanors – prostitution, drunk driving, simple assault, trespassing, vandalism, drug possession. All things that you would expect a person to be arrested for, not just ticketed. yea seeing “magazine” was refreshing. Yea its kind of scary that someone could just plant a gun in your bags or your car, and you would get in trouble for it. I’m really surprised that doesn’t happen more often. 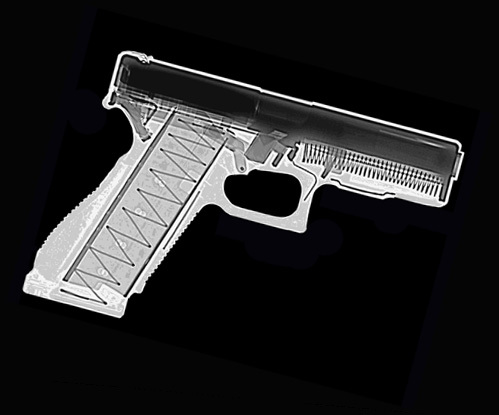 Wait, you mean you can see a Glock with an x-ray scanner? I thought it was made of porcelain in Germany, was opaque to x-ray scanners, and cost more than most people make in a year. The more you know, I guess. Somebody be sure to tell Josh Sugarmann, Sarah Brady, Carolyn McCarthy et al. I almost forgot about all they hysteria when Glocks came onto the market…the plastic undetectable pistol. I remember one news story after another with that slant. Ironic how it has become one of the most used firearms for police. haha yea the media blew the whole “plastic undetectable firearm” thing WAY out of proportion. Impossible. Everyone knows that those plastic guns are impossible for security to catch. That’s why we have to try so hard to ban them! Besides, don’t standard Glock magazines have more than ten rounds? Not a standard magazine for a subcompact (which would fit nicely in a carry on bag). A Glock 26 (I believe) would be 9mm with a 10-round magazine. Ah. Ok. I didn’t know which kind of Glock. The pic didn’t look like a subcompact (not that the pic has anything at all to do with the story). Maybe she’s from that Nazi state that limits ya to 10rd mags? I’m suprised, considering the agency, that it wasn’t a Sig Suaer P226N. The agency of flight attendants? Is there a standard-issue sidearm for a flight attendant? I was making a joke about “Delta”. No matter. LOL I didn’t catch the joke at first. Pure WIN!